CJ was hired in 2013 as a full-time employee. Since then, she has received 100 hours of migratory bird training from the Birds of Prey Foundation, attending IAATE and NWRA symposia, and is a lead training in our outreach education program. 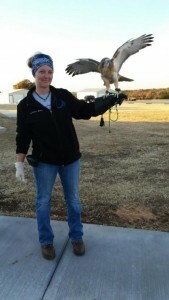 She enjoys observing plants and animals and showing compassion to wildlife. She values the promotion of wildlife education and awareness to encourage compassionate actions to relieve animal suffering and extinction.